Alexandra Nadane, President of Studenti pentru Viata (“Students for Life”, a Romanian pro-life students association) has dedicated her life to helping mothers in pregnancy crisis and promoting a culture of life among Romanian youth. Basilica.ro, the news agency of the Romanian Patriarchy, has recently interviewed her about the March for Life and its message for the Romanian society. Studenti pentru Viata organizes March for Life in Romania’s Capital city Bucharest and offers support and know-how to other March for Life local organizers nationwide. Alexandra Nadane’s message, and the message of the March for Life Romania and the Republic of Moldova is the following: “We do not plead for banning abortion, but for changing our hearts and creating practical ways of support [for women]”. She has also emphasized that “the march is non-confessional and apolitical, uniting people of all religious denominations and supporters of different political doctrine who understand that a society can develop only as long as it protects the life of its most vulnerable members”. Alexandra Nadane mentions as one of the essential goals of the march the establishment of at least one pregnancy crisis help center in each county. “It is the only way to offer real support”, she warns, explaining that “one of the reasons why people go to the march is that they want society to react by creating support tools for women in pregnancy crisis”. Alexandra Nadane also speaks about the support needed by women in pregnancy crisis and warns that “abortion is a trauma for the woman and loss of life for the baby”, showing that choosing life for one’s baby has become a really “heroic act” nowadays. Please read below the integral interview. Basilica.ro: You are truly a pro-life ambassador in Romania. What was your greatest satisfaction – but also your greatest disappointment – in your endeavour? Alexandra Nadane: I am happy about every pro-life activity I am involved in. Any action that supports life, no matter how small, brings fulfillment, because it helps others. I am excited to meet people who come to our pro-life trainings. It makes me happy to see the young people’s energy and curiosity, because that is what helps them grow, give, and choose the good in their lives. They are important encounters, at the end of which people go back and start building beautiful things in their communities. I think that what I enjoy most of all is an embrace from a woman in pregnancy crisis, at the end of a meeting with us, where she has come because all other doors were shut to her. That is where our greatest challenge lies: to manage to inspire trust, courage, and power to a woman who wishes to choose life but feels she is struggling in vain. Sometimes, women in pregnancy crisis end up asking for help after having lost all other hope. This is why it is highly important to help them regain their confidence and look calmly to their future. In many cases, they find out late that there are solutions and that they can receive help – so a calmly-said “thank you” at the end or “I am glad that you are helping me to give birth to this child” represent the greatest joy. As for disappointment, it does not come from the outside, even if I sometimes face many difficulties that are not easy to overcome. I am disappointed in situations I cannot manage to harness the actual potential of some contexts, in difficult moments that I could have managed better had I had more experience and known certain things, as well as by my own mistakes and shortcomings, which tend to influence the outcomes and my relationships with those around me. I am working on it every day, being aware that both good and evil “spread”. There is no good that can help only me and no evil that will not affect the others, too. Basilica.ro: When did you become a pro-life activist? What was the decisive moment which made you join the fight for this cause? A.N. : I have always known that what lies in a mother’s womb is a child. I think we all know that deep in our hearts, but during a pregnancy crisis, the unexpected news and one’s uncertainties about the future get the upper hand. When I entered the 9th grade, I felt a strong desire to do things that would help the people around me. That is when I chanced upon a thought by Albert Einstein: “Only a life lived for others is a life worth living”. Einstein lived by that principle and these words guided me until I met a number of special people, who helped me along that road. I was involved in various projects and organizations until one day when, as a media coordinator at an association, I received an email from a 24 year-old woman, saying that she was pregnant and wanted to keep the child, but for the past two months, her parents had been putting pressure on her to have an abortion – and she was at the end of her tether. The message ended with a desperate call: if nobody helped her, she would have an abortion, even if she did not want to. When I told my superiors, I was shocked by their reaction. They said that the organization could not help, that they addressed other types of issues and that I should ignore her message. At that point, the first thing I asked myself was: “Will I be able to live with the fact that I have ignored this call for help?” The answer was no – and I quickly telephoned the woman and suggested to meet her. When we met, I told her two things: “Whatever happens, from this point on, I will help you in every way I can. You can look upon me as your sister”. And the second thing: “Things may likely improve with your parents and you may make up with your boyfriend, but you will never be able to get this child’s life back”. It was a touching moment. She told me it was the first time she met someone who tried to encourage her. She hugged me and said she would keep the child. 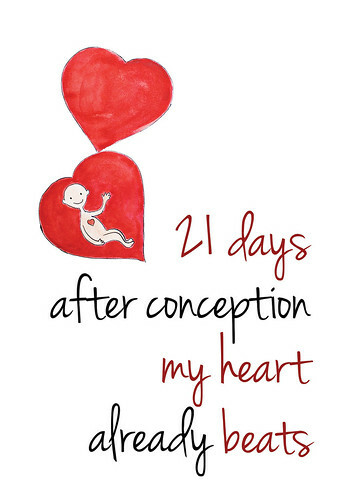 I was happy, but then I thought that once she would go home, her parents might start pressing her again to have an abortion, and she would no longer find enough strength to ask for help. So I asked her if she agreed for me to accompany her home and talk to her parents – which she did. When we got there, her parents started telling me that they could not let her keep the child because it would have no place to stay, they could not provide to it, she had no medical insurance, no money for medical care, etc. I tried calming them down and asked them to make a list of things that they would need in order to keep the child. I took the checklist, looked into their eyes, and said: “Don’t lose heart! I will help you with everything that is in here, only let your daughter keep the child.” God made this miracle happen and they trusted me. From that moment on, they started rejoicing that they would have a grandchild and wondering if it was a boy or a girl, what name they would call them, what godparents they would choose, etc. Back home, I started looking for solutions, because neither me, nor my family would have been able to help her with everything she needed. In the end, I wrote an article on my blog, hoping that someone will see it and will be able to help her. The next day, a lady called who wanted to help her with a doctor that would monitor her pregnancy. Then within a fairly short amount of time, several people came forward, offering to help. The young woman gave birth, married the child’s father, her parents calmed down, and now the young couple has two more children. That was the moment that changed my life. I understood that for many women in pregnancy crisis, it is important that they receive a bit of help, so that their life changes for the better and they can raise their own children. Basilica.ro: Please tell us how many people have you helped overcome difficult moments and choose life, through the Students for Life Association – and more recently, with the aid of the St. Alexandra the Empress Centre? A.N. : Over the past eight years since I began being involved in pro-life activities, I have met hundreds of women who went through pregnancy crisis and more other people who stepped in and helped them. We have never set upon doing an actual “count”, for two reasons. First, we can never say that someone has chosen life and had the power to carry the pregnancy to a good end only thanks to us. Second, certain activities, testimonials or messages reach out to persons in pregnancy crisis and help them; these persons manage to have successful pregnancies and we never find out about them. It is all the more difficult to quantify the changes in mentality, the number of people who were informed and later on chose life, or the number of people who moved from being mere onlookers to actually pro-life activists. At the St. Alexandra counseling center, they keep a clear track of all this, because they are a social center. Since October 2017 until now, there were twenty cases who benefitted from psychological counseling and social work. Basilica.ro: The first edition of the March for Life took place in 2008 in Timişoara. Were you involved in that project? Could you give us more details about it? A.N. : I was 15 years old in 2008. I was in the tenth grade, at the “Nicolae Kretzulescu” commercial high school. I was the head of the “Students’ Advocate” Committee of the Students’ Board of the Bucharest Municipality, where I was trying, along with colleagues representing other high schools in Bucharest, to find solutions to students’ problems, to mediate the relationships between teachers and students, and to help abused students. The same year, I started training for a certificate under the third Millennium Leadership program, which over the following two years helped me give training sessions in communication, team work, and negotiations, to high school students. It was also around that time that I learnt about the humanitarian actions led by the Red Cross of the capital’s sector 3, where I subsequently ran the social and media departments until 2010. Back then I knew nothing at all about the pro-life movement, or about any pro-life organizations or the March for Life, but I was trying to help those in need by the available means. Of course, my workmates and I always debated on various issues and my standing was always clear. I was supporting life without being aware that such organizations actually existed. Things changed in 2010, when I met the young woman I was telling you about – but not everything went smoothly from then on. I felt this strong urge to do something to help women in pregnancy crisis. I had just seen how much there was a need for it, but did not know what, where, and with whose assistance I could do. Then I met a young family who helped me get to Valea Plopului (Poplar’s Valley) and see what wonderful things Fr. Nicolae Tănase was doing for mothers and children. Initially, I wanted to stay there and help, but Fr. Nicolae convinced me that there were things to be done in Bucharest. For the following three years, I was searchin, documenting, talking to people in the pro-life movement, knowing pro-life organizations in Romania, in the U.S. and other countries, and gained an understanding of the needs and problems young people deal with. The moment I realized the need for a students’ pro-life organization was when I wrote an article about couples that separate after an abortion and then received 25-30 comments from young women in various cities in Romania saying that they were pregnant, that their partners did not support them and threatened them, and that their families threatened them too to put them out of their houses. That was when I understood the need for actual support, information and constant activities, and not just stating that abortion is traumatic to women and causes the loss of the child’s life. In 2013 we were involved in the organization of the March for Life, and in 2014, the “Students for Life” Association organized the pro-life march in Bucharest. We started helping out as much as we could – yet systematically – during the organization of the Marches for Life in as many cities in Romania and the Republic of Moldova as possible. We suggested that the March should encourage people to come together in a solidarity chain around a theme. Our first attempt was in 2013, when we had three themes, of which the main one was: “Love both of them!” followed by: “Love both mother and child!” and “Assume, help, adopt!” The following years, each March had a specific theme, with an underlying pro-life principle addressed to everyone: “Adoption – a noble choice” (2014), “Every life is a gift” (2015), “For life, for woman, for family” (2016), “Help the mother and the child! They both depend on you” (2017). This year’s theme is “A World for Life” (2018). We see all these themes as principles that are stepping stones towards solving the specific problems related to pregnancy crises. The efforts and dedication that different people put into the first march for life (2008) – as well as into the ones held in Bucharest, Iași, Satu Mare, Cluj, and other cities over the following years – were important, as subsequent things were built upon what had been done previously. Two of the most important suggestions made during this March for Life, which need to be implemented as fast as possible are: granting an indemnity to the pregnant woman after her fourteenth week of pregnancy, to help her cover the specific needs that come up during pregnancy, and setting up help centers for pregnant women, where women in a pregnancy crisis may benefit upon request from free psychological counseling as well as the support of a social worker specialized in pregnancy crises, including other forms of support, according to her needs. We believe that the presence of at least one pregnancy crisis center in each county should be among the main objectives of the March for Life. Why? Because only in this way can one provide actual assistance; and one of the reasons why people join the March is that they want the society to get mobilized and create the necessary support tools for the women in pregnancy crisis. I would like to add that we do not plead for banning abortion, but for changing our hearts and creating practical ways of support. The March is non-confessional and non-political, but gathers together people of all confessions and supporters of various political views, who understand that a society will grow only to the extent to which it will protect every one of its members. The latest statistics show 22.876.056 abortions occurred in Romania between 1958 – 2016. On a global scale, according to the latest estimations, we rank number 5 among the countries with the highest percentage of abortions, followed by the Republic of Moldova. Basilica.ro: The abortion statistics in Romania are dreadful. Would you please convey a message to all persons who find themselves in a delicate situation and consider having an abortion? A.N. : Choosing to bear an unexpected child is an act of heroism. Despite it being a very difficult choice, it is the most beautiful path. Nothing can compare to the happiness a mother has after fighting hard for her life and of her child, and seeing them both do well. Truly helpful solutions are those that help both mother and child, so that they can stay together and enjoy life. Hardships will end, and you will be happy about your child. The number of those who could have been among us and done good things in this world and did not get the chance to be born – is too high. Just as the number of women affected by this trauma is. The regrets of women who had an abortion thinking they had no choice are painful. They had a choice – but there was no one around them to help. It is important to know that solutions exist. Search for an organization or a center that helps women in pregnancy crisis. Talking to a counselor will help you find out an array of opportunities you have never thought about. Ask for help among the people around you, telling them what you are going through. I also believe that when a woman in pregnancy crisis prays to God to help her, God will send her a person to do just that. He will soften up someone’s heart and make them see there is a woman in pregnancy crisis near, needing help. Ask and you will receive, knock and the door will be opened to you! God loves you and loves the child you carry in your womb. It is His child that He has entrusted you so to take care of! He will help you do that – and moreover, He will take care of both of you!